For the past twenty years with four albums as a leader, several studio projects as a side man, and countless worldwide performances, saxophonist, vocalist and composer Juli Wood has established herself as a solid, swinging, lyrical and entertaining performer on Chicago’s music scene. Juli has played many jazz clubs and festivals nationally and internationally; Chicago Jazz Fest, Hyde Park Jazz Fest, Milwaukee’s Summerfest, Chicago’s main jazz clubs – Jazz Showcase, Green Mill, Andy’s and Katerina’s. Skansen Jazz and Blues (Stockholm , Sweden), Pori Jazz Fest (Finland), Bent J’s club (Aarhus, Denmark), Storyville (Helsinki Finland), Arlandia Jazz Fest (Aaland Islands, Finland) and the ” Made in Chicago ” jazz festival in Poznan Poland to name a few. 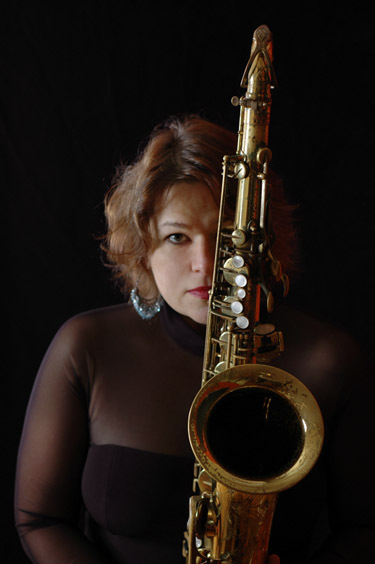 Juli is in the tradition of saxophonists who were also great vocalists; Cleanhead Vincent, Eddie Harris, and Louis Jordan. Never has that been more apparent than in “5 4 3 2 1 Juli Wood,” her latest recording and most ambitious project to date. One of the pleasures of attending the Chicago Jazz Festival over Labor Day weekend each year is being able to hear the bevy of local players who make up the windy city jazz scene. Last year’s treat was Juli Wood, a gutsy tenor and baritone saxophonist who also sings with the earthy gusto of an R&B diva filtered through a hard bop sensibility. “I studied jazz music at the Wisconsin Conservatory of Music with David Hazeltine and Berkley Fudge. I’ve been so fortunate to be mentored by wonderful jazz artists. I played a lot in Milwaukee and Chicago with Melvin Rhyne, a great bebop organist who began his career in Indianapolis with the Wes Montgomery trio. Mel and I recorded a CD with a quintet that also played at the 1998 Chicago Jazz Fest. That CD, Movin’ and Groovin’, the Juli Wood Quintet featuring Mel Rhyne is available at CD Baby, iTunes and Amazon. Juli’s quartet recording featuring Earma Thompson – piano, Dennis Carroll – bass and Mike Schlick – drums.” Blues for Earma Jean is available at CD Baby, iTunes and Amazon. “My recording 5 4 3 2 1 Juli Wood features my latest quintet incarnation. My horn section buddies from the gospel band at Christ Universal Temple, Larry Bowen – trumpet and Steve Berry – trombone are both accomplished jazz musicians. The rhythm section is the wonderful Pete Benson – organ and swinging Todd Howell – drums. The smaller group tunes feature Dan Delorenzo – bass and Mike Schlick – drums. The concept for this CD came from a Benny Golson recording called “Pick a number from 1 to 10.” Benny plays solo, duo, trio, quartet etc… each song adding another player. I decided to go the other way and start with five players then start subtracting. Actually the quartet tunes are me overdubbing either a tenor or bari sax part on the melodies. It was a lot of fun to record and I think we captured some great arrangements and performances. 5 4 3 2 1 Juli Wood is available at CDBaby, iTunes and Amazon. Juli’s latest recording, Synkkä Metsä, is of Finnish folk songs. “My grandparents all came from Finland to the USA in the early 1900’s. I grew up hearing the music and my parents taught me a little of the Finnish language. I was on one of my yearly trips to Finland to play a few festivals and clubs, and was listening to Art Farmer’s recording of Swedish folk songs called To Sweden With Love. It hit me then that I should make a CD of the simple and hauntingly beautiful Finnish folk songs, instrumentally and in a jazz style. The CD, called Dark Forest or Synkkä Metsä in Finnish features Alejandro Urzagaste – guitar, Clark Sommers – bass and Mike Schlick – drums. Synkkä Metsä is available at Amazon and OA2records. Read the Review. “Finland is mostly forests and lakes. It’s a magical place dear to my heart!” Juli is thrilled to be the recipient of two grants from the Finlandia Foundation in 2018. One grant is for research, rehearsal , performance and recording of a follow up of Finnish folk songs to her 2015 recording ” Synkkä Metsä “. Her other grant is to travel to different Finlandia Foundation chapters in the USA and perform Finnish folk songs in jazz styles as the Performer of the Year 2018/2019. Juli also has played with a quartet for the ACE ( Arts in Community Education )program run by the Milwaukee Symphony Orchestra. Every year for the last twenty years , the Juli Wood Quartet has performed in elementary schools in the greater Milwaukee metropolitan area. The group plays songs that the children recognize, and also introduces the students to the rhythms , harmonies, and melodies of jazz music. She is also involved in the mentoring program affiliated with the Jazz Institute of Chicago called ” The Women’s Leadership Initiative ” The mentors teach workshops and host jam sessions for young women who are learning jazz improvisation skills.